Isn't a great idea to display a nice loading animation or icon on your webpage until the page loads completely? It adds a cool little animated touch on your site and it acts as a buffer that fills in the gap of waiting time. Most of the users / website visitors love to see animation on websites. WHY? well, animation helps in keeping the users engaged with the website and its content. Animation also helps in directing the users to the right directing and keep the users from leaving the site too soon. In this quick tutorial, we will learn how we can display a loading icon until the page loads completely in nopCommerce. This solution can check if the user (site traffic) is coming from a specific webpage or a website URL and based on that it will redirect the users accordingly. Recently, I was a part of this migration project in which a complete website was redesigned from scratch using bootstrap framework and data from the old site was migrated to the new site. In this project, I was involved in testing the brand new site and making sure that the migrated data is correct. During the testing phase, I found one major problem with the content – i.e. unresponsible tables. Everything on the new site was responsive except the tables. I came up with an idea of making unresponsive tables responsive and it fixed the problem globally on the new site. Today, I will be sharing that “quick fix” with you guys…. 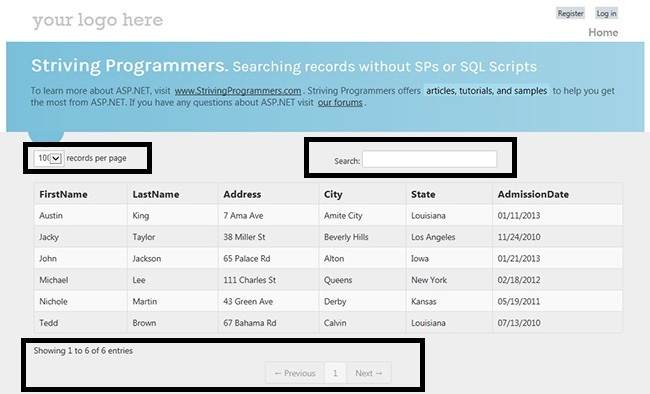 A great way to search records on client-side without getting using stored procedures or SQL script just by using jQuery and css stylesheets. Usually, many developers make use of stored procedures or SQL scripts to perform search which is kind of a common approach. It includes number of steps such as: writing a long stored procedure, placing a text box on your page that will enable a user to type a search term, execute the stored procedure on the search button click and passing the types parameter to the stored procedure and the results are displayed. An easy method to calculate addition of two numbers using java script.